I remember how much I anticipated Saturday afternoons, when my sister would walk me to the Flushing Public Library for my weekly fix of books. 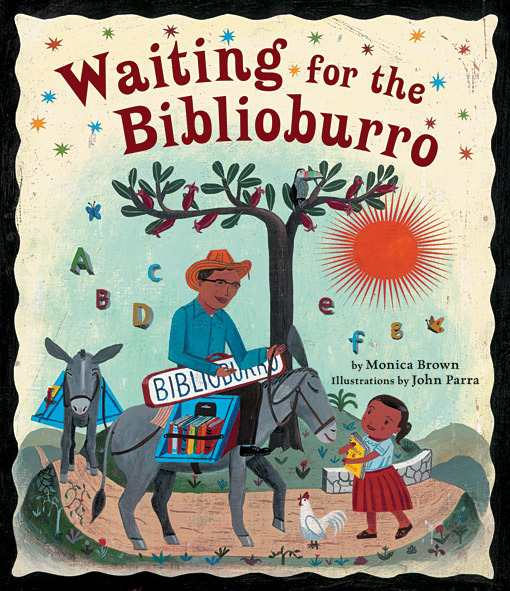 Ana, a girl growing up in rural Colombia, shares that eagerness for stories in WAITING FOR THE BIBLIOBURRO (Random House) by Monica Brown, illustrated by John Parra. Like me, Ana also discovers the joy of creating her own stories. Recommended by my librarian, Jean Holmblad of the Newton Free Library, this gorgeous picture book is inspired by another librarian, Luis Soriano Bohórquez. A visionary man who grasps the power of books to change the world, Bohórquez spends hours transporting them to children around Colombia on two donkeys, Alfa and Beto. I'd love to read this story to kids and let them feast their eyes on Parra's paintings. Then I'd ask, "Why did the man go through so much trouble to bring the children books to read?" Watch Biblioburro - Trailer on PBS. See more from POV.